The PS4 console proved to be more successful than the XBox One over the past five years, and Sony prepared a special infographic covering some interesting sale figures including total units sold, total game titles sold, best-selling games, most downloaded games and favorite controller color. The company also announced a new CoD – Black Ops 4 bundle that will be available on November 27. Five years ago, on November 15, Sony was launching the first PlayStation 4 consoles that were meant to go head to head against Microsoft’s Xbox One. It looks like the PS4 was more successful over the years, and Sony released an infographic with some interesting sale figures for the fifth anniversary, including most popular games, best-selling controllers and more. To start things off, worldwide unit sales topped 86 million (as of September 2018) and these figures include the PS4 Pro version, as well, while software sales came in close to 778 million units (as of June 18). Yes, this information is a bit outdated, but Sony decided to stop providing sales figures a few months ago, so these might be the last accurate figures for PS4 before the PS5 launch. Sony also found it useful to mention that PS4 has had 11 major updates (V 1.01 through V 6.00) since launch. The DualShock 4 has a special feature involving the most sought-after controller colors. In this respect, the default black color came out on top, followed by blue, red, white and camo. Moving on to game sales, the top 5 best-selling titles in the past 5 years are: Call of Duty – Black Ops 3, Call of Duty – WWII, Fifa 17, Fifa 18 and Grand Theft Auto V, but Sony did not rank these by sale figures, just by alphabetical order. The same alphabetical listing was used to present the most popular and most downloaded games. 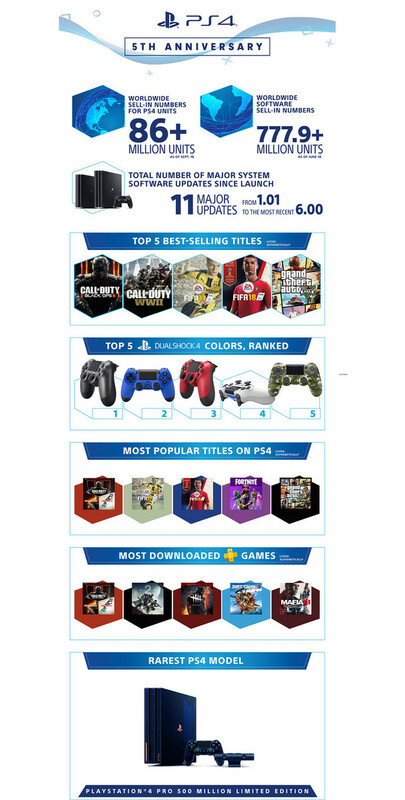 For the most popular titles Sony mentions CoD – Black Ops 3, Fifa 17, Fifa 18, Fortnite and GTA V, while for the most downloaded PlayStation Plus titles we have CoD – Black Ops 3, Destiny 2, Dead by Daylight, Just Cause 3 and Mafia III. Sony ends the infographic by mentioning that the rarest PS4 model is the PS4 Pro 500 Million Limited Edition that was launched recently to celebrate the 500 millionth unit sold since the launch of the first PlayStation in December 1994. 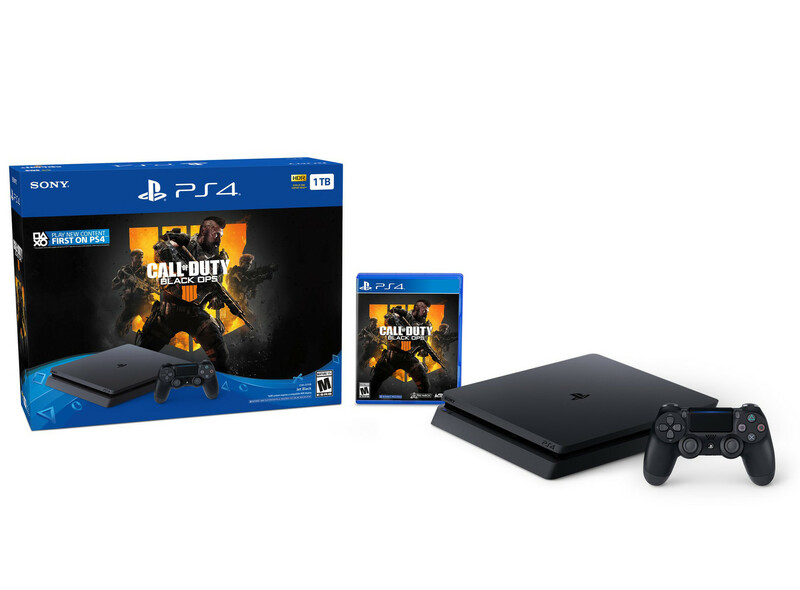 The blog post that includes the infographic also announces the availability of a new bundle consisting of a jet-black 1TB PS4 and the CoD – Black Ops 4 game that will go on sale on November 27, but can already be pre-ordered from Best Buy. Surprisingly enough, Sony recently announced that it will not attend the E3 event in 2019, so it seems like the next gen PS5 console will most likely be launched in 2020.